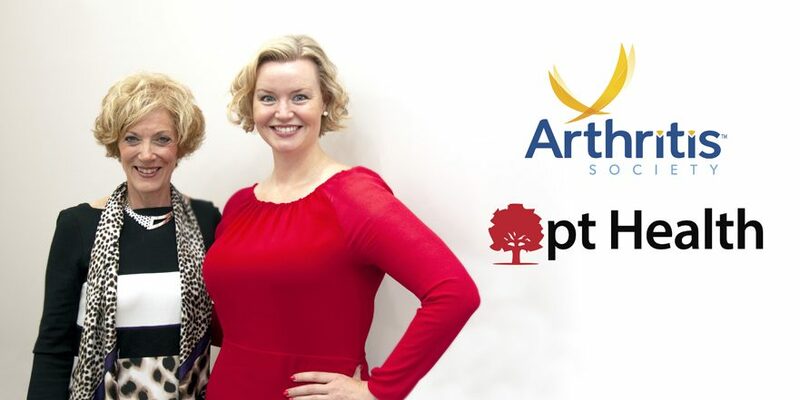 We have partnered with the Arthritis Society! What does our partnership mean for you and all our past, present, and future patients? Well, here at pt Health, we have a commitment to helping Canadians across the country get the care they need to reduce pain, feel their best, and live the highest quality of life possible. Our partnership with the Arthritis Society as their National Physiotherapy Champion will further our cause by increasing arthritis awareness, empowering Canadians with information, starting a conversation about the disease, and continuing our commitment to quality care. Arthritis affects 6 million Canadians at all ages and stages of life, and at the moment, there is no cure. Let’s pledge to remove the stigma and humanize arthritis by starting a discussion about this all too common disease. Share your stories of struggles and triumphs using hashtag #ArthritisAware. Show your support, start a conversation and pledge to be #ArthritisAware, get your digital Arthritis Awareness Month ribbon for Facebook and Twitter! Keep an eye out for even more videos, stretch guides, blogs, and contests throughout 2018 to help spread information about early arthritis detection. Arthritis Awareness Month 2018 is our kick-off for our year of content aimed at empowering Canadians with the information they need to better understand the symptoms of arthritis, how to manage it, and better advocate for themselves. Be sure to follow us on Facebook and Twitter, and sign up for our newsletters to get early entry in contests. Our clinic teams across Canada are passionate about helping people with or at risk of developing osteoarthritis; they show it through their continuing education, their keen attention to detail, and through an open dialogue with each and every pt Health patient. We’ve put up “Ask us About Joint Pain” posters in every clinic across Canada to help start a dialogue and get patients better, sooner. Don’t be shy, we love talking about arthritis symptom management and preventative care! pt Health physiotherapists are skilled, trained, and experienced in the treatment of arthritis. Through our partnership with the Arthritis Society, our clinicians will have improved access to quality education to help provide even better, more focused care for patients affected by osteoarthritis and/or rheumatoid arthritis through the Getting a Grip on Arthritis® education program. We are honoured to be the Arthritis Society National Physiotherapy Champion, together we will fulfill our common goal of delivering better health outcomes and an improved quality of life for Canadians affected by arthritis. We can’t wait to share all the exciting things we have planned for you. Right now you can discover how osteoarthritis physiotherapy can help reduce pain, optimize function, and improve your quality of life, click here.